This is a truly stunning site – not as much for the megaliths that are here, but for the setting in which they’re held. “Magnificent” is the word that rolled out of my mouth a number of times; whilst respected activist and ‘Organic Scotland’ creator Nina Harris said, quite accurately, “it’s Caras Galadhon in Lothlorien!” (or words to that effect) – and she hit the nail much better than I did! 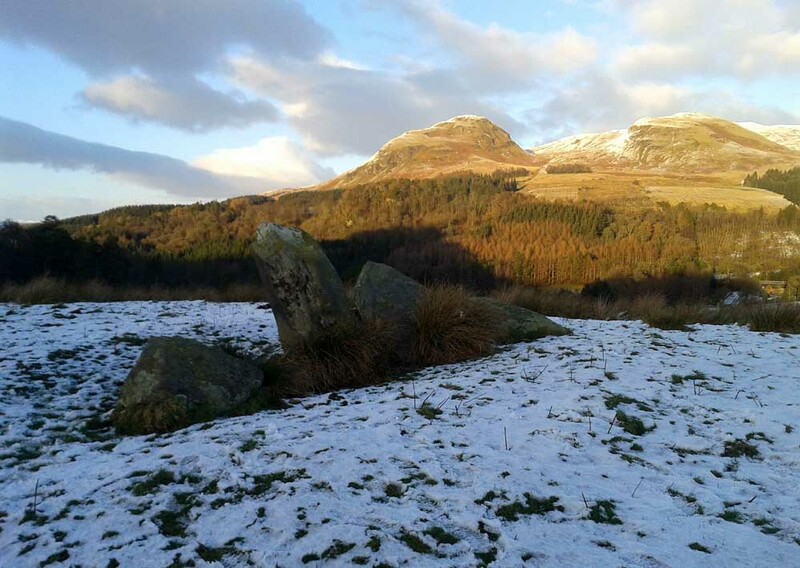 “At Blanefield near Strathblane in Stirling a big stone, its longer sides aligned east-west, stands at an angle amongst a southwest-northeast line of four others, fallen, of which one just off the line seems to have been added this century. The setting has been presumed a collapsed four-stone row. Known also as Duntreath and Dumgoyach, the setting is slightly concave. 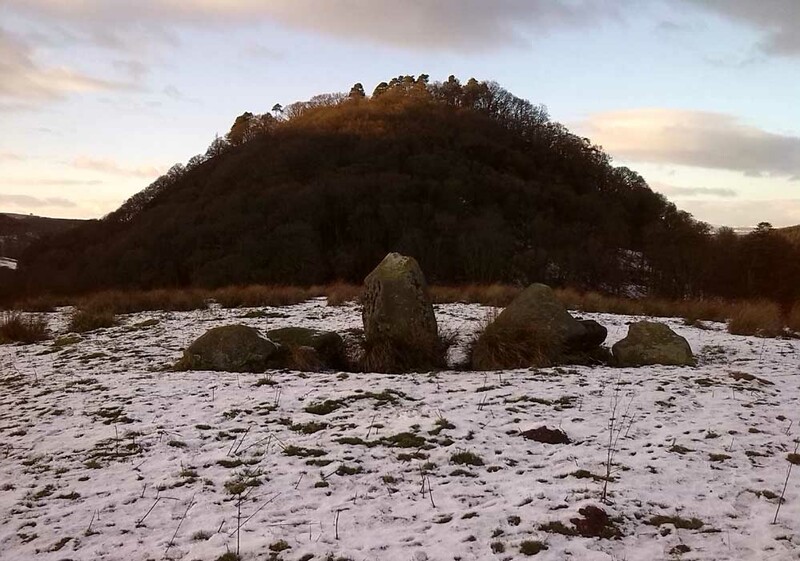 “‘This ruinous alignment indicates notches to the northeast and these show approximately the midsummer rising sun.’ ‘The standing stone has a flat face exactly aligned on a hill notch to the east,’ quite neatly in line with the equinoctial sunrises. These astronomical analyses would seem to confirm that Blanefield was undoubtedly a row set up by prehistoric observers to record two important solar events. “Excavation in 1972 discovered signs of burning, flints and charcoal that yielded a C-14 assay of 2860±270 BC (GX-2781), c. 3650 BC, a time in the Middle Neolithic when chambered tombs were still in vogue, but an extremely early date for any stone row. 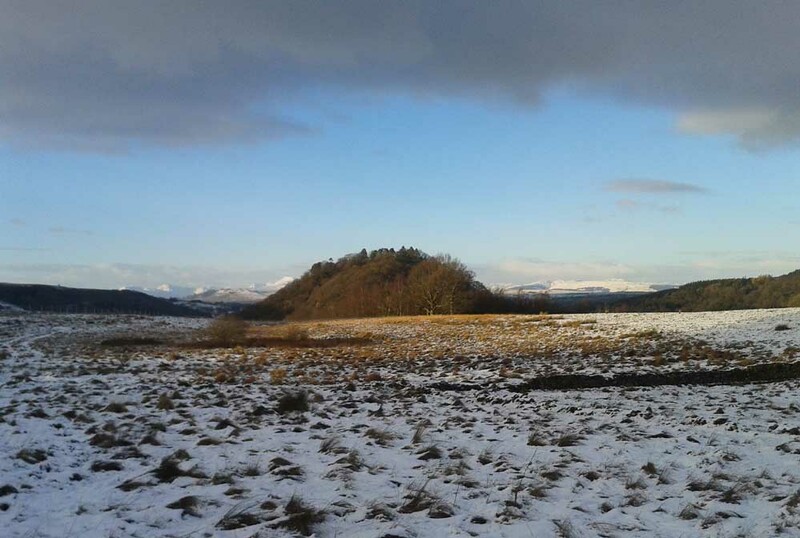 This, coupled with Blanefield’s isolated position for a row in central Scotland, raises doubts about its origins. However, there was once another stone row close by, known as the old Stones of Mugdock. Burl then cites the proximity of four nearby neolithic long cairns not too far away, with the Auchneck tomb just 3½ miles (5.6km) to the west; although it seems that Nina Harris may have discovered another one, much closer still (TNA will have a preliminary report on this in the coming months). Feachem, Richard, Guide to Prehistoric Scotland, Batsford: London 1977. Heggie, Douglas C., Megalithic Science: Ancient Mathematics and Astronomy in Northwest Europe, Thames & Hudson: London 1981. MacKie, Euan W., Scotland: An Archaeological Guide, Faber: London 1975. Ritchie, J.N.G., “Archaeology and Astronomy,” in Heggie, D.C., Archaeoastronomy in the Old World, Cambridge University Press 1982. Royal Commission on the Ancient & Historical Monuments Scotland, Stirling – volume 1, HMSO: Edinburgh 1963. Smith, John G., The Parish of Strathblane, James Maclehose: Glasgow 1886. Thom, Alexander, Megalithic Sites in Britain, Oxford University Press 1967. 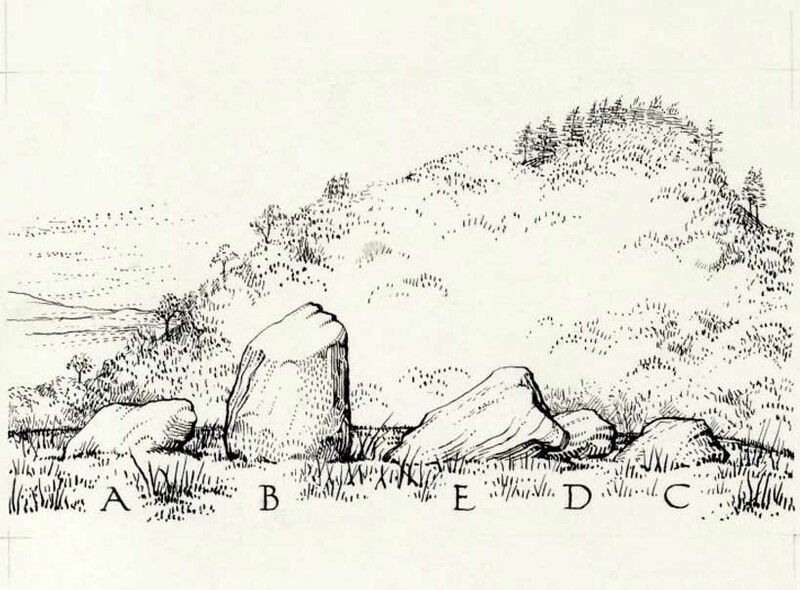 Thom, A., Thom, A.S. & Burl, Aubrey, Stone Rows and Standing Stones – volume 1, BAR: Oxford 1990. 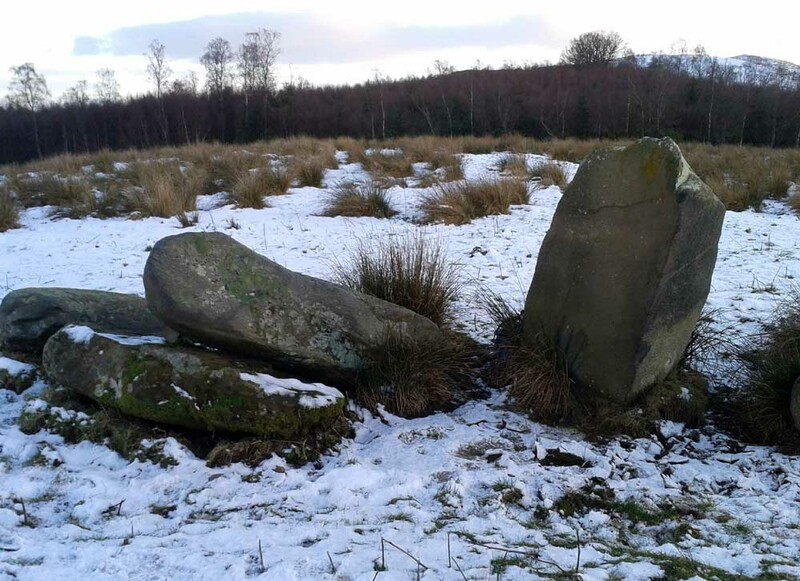 Acknowledgements: A huge thanks to Nina Harris, of Organic Scotland, for both taking me to these stones and sharing her photos for this site profile. Cheers Nina! This entry was posted in Scotland, Standing Stones, Stirlingshire and tagged animism, antiquarian, antiquities, archaeoastronomy, Archaeology, astroarchaeology, astronomy, Bronze Age, cairns, Carbeth, earth mysteries, heritage, Lord of the Rings, megalithic, Megaliths, neolithic, prehistoric sites, sacred sites, Scotland, Standing Stones, Stirlingshire, Strathblane, tombs. Bookmark the permalink. Reblogged this on THE BARCARII.